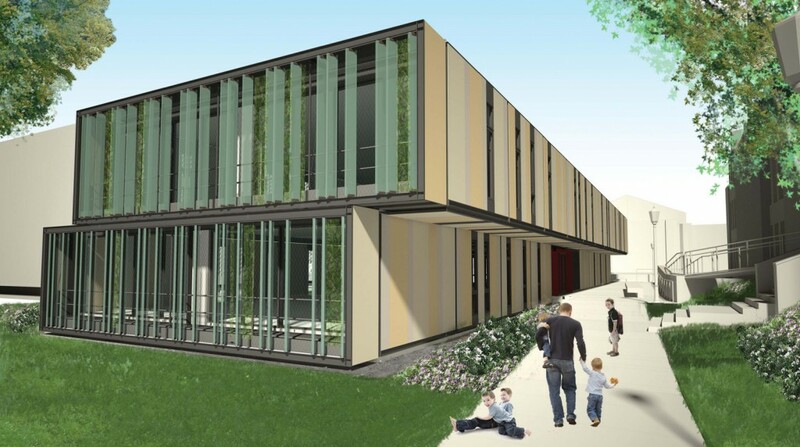 The design and construction of Lehman College’s new Child Care Center is winning international recognition. Axis Construction, construction manager and contractor for the center, was honored with the Modular Building Institute’s (MBI) first place Award of Distinction in the permanent modular education category for buildings over 10,000 square feet. Axis was recognized at MBI’s annual convention last month in San Antonio, Texas. The state-of-the-art project was judged against entries from around the world in a highly competitive international contest. The 12,000 square foot center, designed by Brooklyn-based Garrison Architects, was assembled from 22 prefabricated modules—each weighing 18 tons—and hoisted into place with a 600-ton crane. Learn more about the center’s unique modular construction. For the Child Care Center, Axis partnered with NRB, Inc., an off-site modular building design and manufacturing specialist with locations in the U.S. and Canada. The building was produced at NRB’s facility in Ephrata, Pennsylvania. NRB is well known in the industry for its cutting-edge research and development, and for applying enhanced building science principles to their off-site construction. “The Axis team is extremely proud to have been honored with this highly-acclaimed industry award. We strive for excellence and innovation in every project we undertake and it’s very gratifying for our efforts to be recognized by the Modular Building Institute,” said Axis President and CEO Ralph Lambert. The new Child Care Center opened in September 2013 and accommodates 120 children of Lehman College students, twice the capacity of the previous center. The Center gives more students the opportunity to attend college—by providing convenient child care facilities. The facility has six classrooms, a multipurpose room, terraces designed to grow greenery, an atrium with an open stairway, skylights offering a natural ventilation system, and other features.